Our free extension cost calculator is the perfect tool for working out the budget for an extension to your home. The first step in any project should be establishing what you can afford to do, and this is especially important if you are undertaking a large job. With our free tool you can estimate extension costs when extending a house to check you have adequate funds. Answer a few simple questions, including where you live, the kind of extension you’d like to add, and how much of the work you’d like to do yourself, and it will provide you with an instant, accurate result telling you how much your finished extension cost. There are many factors involved in costing an extension project, from the size of the project right down to the quality of the paint you use on the walls. 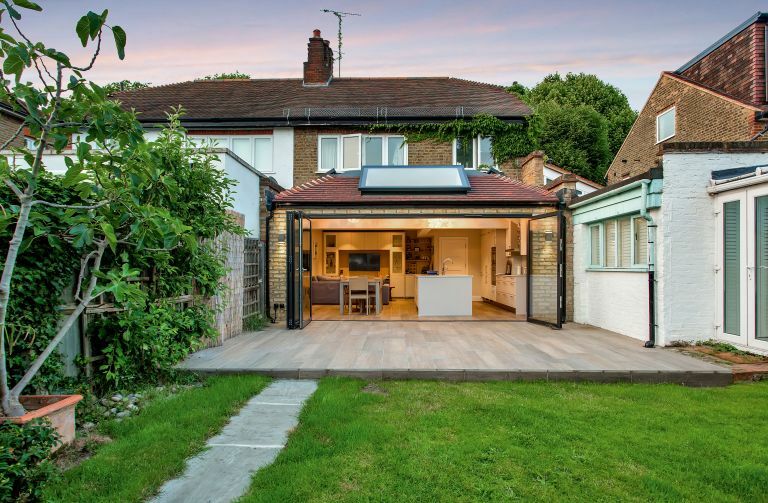 You may be surprised to learn that if you are building a double storey extension, it may end up costing less per square metre than if you are planning and designing a single-storey extension, as the cost of the roof and foundations are spread over two floors. Approaching only one or two builders could give you an idea of a false average building cost. Get started in the form below. Please note this is for valid UK post codes only. Terms and conditions of use of the calculator, and FAQs. The extension cost calculator figures exclude Value Added Tax (VAT). VAT will be applied to all goods and services supplied by VAT registered building contractors or subcontractors, and by suppliers, at the prevailing rate, usually 20%. Some VAT concessions are made on certain categories of work – see HMRC VAT Notice 708 for details or visit www.gov.uk/vat-builders. Mainly DIY plus some subcontractors: Building on a largely DIY basis, substituting around 30 per cent of labour costs with DIY, and employing help with the rest of the building work. Materials purchased directly. Enter the number of storeys above ground for this element of your extension e.g. a single storey extension has one storey, a two storey extension has two storeys: ignore basements and loft conversions - the calculator allows basement extensions and loft conversions to be entered as separate elements. Enter the gross internal area (GIA) of the ground floor of this element of your project in m2. Enter the gross internal area (GIA) of the first floor of this element of your project in m2. Some projects include an extension above an existing single storey garage or other existing part of a property – this is why the calculator allows separate entries for each storey. Enter the gross internal area (GIA) of the second floor of this element of your project in m2. Enter the gross internal area (GIA) of usable (habitable) roofspace for this element of your project in m2. Do not include the area of the existing roof to be converted – the calculator allows you to enter this as a separate element of your project. The average build cost figures for habitable roofspace are reduced by 10 per cent reflecting the fact that part of the cost of constructing the roof is already allowed for in constructing the storey below. The usable area of a roof will depend on the height of the ridge and pitch of the roof. Typically an area of 60-70 per cent of GIA of the storey below is suitable for conversion. Enter the gross internal area (GIA) of basement space for this element of your project in m2. This is the GIA of new basements below new extensions and not retro basements beneath the existing property – the calculator allows you to enter this as a separate element of your project. Angles other than 90 degree right angles are even more time consuming to set out and build and so will increase costs further. Curved walls are amongst the most expensive to build of all. Converting existing loft, garage or cellar space is usually more cost effective than a new above ground extension. The calculator reduces the average cost per square metre (£/m2) by 10 per cent to reflect the economies of using the existing structure. Converting existing roof space is one of the most cost effective ways to add space, assuming the existing roof is suitable for conversion. The calculator reduces the average cost per square metre for new extensions (£/m2) by 10 per cent to reflect the economies of using the existing structure. The average cost per square meter will depend on the complexity of alterations required to the existing roof structure, and the additional volume added to the roof to increase the floor area. The more complex your project the less accurate the calculator will be. Converting existing garage space is a cost effective way to add space to a property. The calculator reduces the average cost per square metre for new extensions (£/m2) by 10% to reflect the economies of using the existing structure. The average cost per square meter will depend on the complexity of alterations required to the existing structure and assumes the walls and roof are structurally sound and suitable for conversion. The more complex your project the less accurate the calculator will be. If the garage requires substantial reconstruction or underpinning it is often more cost effective to demolish the existing structure and to replace it with a new extension built to current building regulations. Converting existing cellar space is a cost effective way to add space to a property providing there is sufficient existing headroom after allowing for the build up of the floor to incorporate insulation and damp proofing. The calculator reduces the average cost per square metre for new extensions (£/m2) by 10 per cent to reflect the economies of using the existing structure. Enter gross internal area (GIA) of new basement space beneath the existing property in m2. This is the GIA of new retro basements beneath the existing property – the calculator allows you to enter new basements constructed below a new extension or under the garden – where costs are lower - as a separate element of your project. In high value areas it can make sound financial sense to extend beneath an existing property, underpinning the existing structure in the process. The cost of excavating beneath an existing property and supporting it whilst the structure is underpinning is expensive and the calculator uses a multiple of three times the average cost per square metre for an above ground extension. The cost of constructing attached or detached garage space is considerably lower than finished living space. The average build cost figures used by the Extension cost calculator for standard garage construction are as below. To avoid double counting, the area of an integral or attached garage should be deducted from the figure (m2) entered for ground floor area. Do you have an estimate of the cost of demolitions/knock through? Planning Application Fees: Householder application currently costs £172. Check with www.PlanningPortal.gov.uk or your local authority what the relevant fees are for your application. Find out more about planning applications in our guide. Building Regulations Fees: Fees will vary according to the size of your extension and the type of project. Check with your local authority building control department, or an independent approved inspector. Allow £500-£1,000 for a small extension or conversion project. Find out more about building regulations in our guide. Site Insurance: £500-£800. If you are moving out at an stage during the project, check whether you home insurer will cover the building during this period. If not, allow for Employer’s Liability, Public Liability, and Works Under Construction insurance. This is available as a combined policy and the premium payable is based on the value of the building contract. Find out more renovations insurance in our guide. Using the extension cost calculator is no substitute for professional advice and judgement, particularly where a property or design proposals have unusual features or a very high specification. Professional advice on build costs can be obtained from a Quantity Surveyor - visit www.ricsfirms.com to find a firm in your area. You can get a more accurate bespoke build cost estimate for your self-build or extension project using the My Building Project Build Cost Estimating Service. Future PLC will not be under any legal liability in respect of any mis-statement, error or omission contained within the data used by the Extension Cost Calculator, or the reliance any person may place thereon.